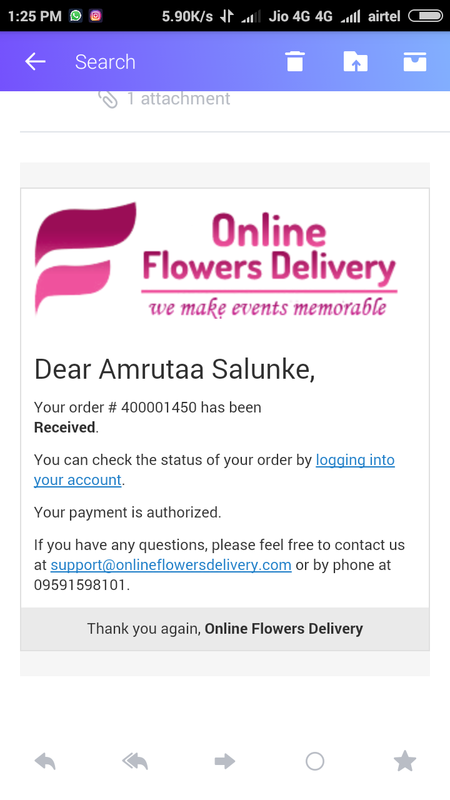 www.onlineflowersdelivery.com/ - this is completely fraud website/ business Customer service agent who checks for the post delivery issue is vry vry rude . He never listen just say abusive words and disconnect call..They are completely fraud and fake. I ordered cake for my frnd who is staying outside India. And when I checked details it was not delivered on his birthday. Then next day when I asked them why you dint deliver that cust service person simply said phone was nt reachable which was a complete lie as phone was alredy reachable and i had already provided alternative numbers .. My brother was at home all the day he neither received call nor anybody visited home for any delivery.And now as per their rule they will not redeliver or refund the amount as person's phone was not reachable (a super fake reason and one of the best reason to fool customer and continue their fraudulent business). That customer service agent or manager was so so rude and very abusive.. Had a frustrating experience and wasted 5k. Friends pls never ever order from that website and cascade thia to all your frnds as well. As this website is completely FAKE. They just take payment in advance that's it and will never deliver product specially when its international as they get very good amount from customer. Very frustrating experience with such ppl and i dnt want others to face same as it really very bad a total waste of time with such not satisfying business company.Total waste of time money and your energy to deal with such ppl. Please take necessary action on this fraud business as they are simply fooling customer and cheating with them . pls pls take some necessary action on them..